Maria Montessori was born in 1870 in Italy. Throughout her youth, Montessori is said to have demonstrated a sharp intuition and inquisitive mind. These talents and more ultimately brought Montessori international fame when she graduated top of her class from the medical school at the University of Rome, becoming the first female physician in Italy. Dr. Montessori became enthralled with human development and returned to the university and earned a degree in Anthropology. She began to wonder what would happen if the hands on, interactive education she offered to the children of the asylum would benefit normal children as well. Building on her established success, on January 6, 1907, Dr. Montessori began an experiment marrying education and childhood development with inner city children from the slums of Rome. This experiment would forever alter the face of early childhood education throughout the world. Working with children in a multi-age setting of three to six years old, Dr. Montessori used a scientific approach of observation and diagnosis in her study of children. She began to see universal patterns of human development. She realized that children construct their own personalities as they interact with the environment. Dr. Montessori found when children were allowed to follow their natural path of development a transformation of character appeared. Negative behaviors, such as tantrums, fear, aggression, and dependence disappeared. Positive behaviors emerged such as concentration, repetition, self-discipline, kindness and respect for others, the desire, to help, and sympathy. She found that by following the children’s innate needs, tendencies, and interests, the children could reach their full potential which was far greater than anyone had expected, including herself. Present day, advanced research in brain development, psychology, and anthropology support Montessori methods. Dr. Maria Montessori created a body of philosophical, psychological, and pedagogical principles designed to support, nurture, and protect this natural, unfolding development of the child. Her life was consumed with traveling the world lecturing, as well as training teachers in the Montessori Method. She believed this method was more than an educational approach, but rather an “education for life.” She had a vision of world peace. Dr. Montessori believed that children who were able to reach their full potential following the natural paths of development in a peaceful and respectful environment would grow to be adults advocating a peaceful and respectful world. This vision and practice won her nomination for the Nobel Peace Prize on three occasions, although she never won. Dr. Maria Montessori was recognized by the international community of educators, psychologists and political leaders. She worked with many influential people including Ann Freud, Erik Erikson, Mahatma Gandhi, Alexander Graham Bell, and Jean Piaget. 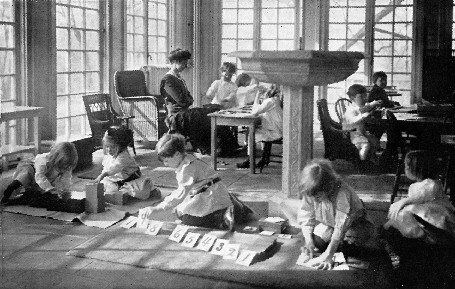 Dr. Montessori died on May 6th, 1952. Her work lives on in Montessori schools across the world, including over five thousand in the United States.